I went to check out Oskar Eustis’s production of Hamlet last night at the Delacorte Theater in Central Park. The skies threatened rain all day, and finally delivered just as the play was about to start. It misted more or less heavily until I left, which was thirty minutes into the show. I kind of feel bad for the actors. They’re the ones who have to suffer the brunt of shame when things go bad. On the other hand, a sense of self-preservation is necessary in all living things. If you can tell things aren’t going right, it’s your responsibility to take up the slack. And Shakespeare isn’t boring! If people are bored the text is not the problem — it’s the production. Hamlet is, in my opinion, the hardest role — ever — for an actor. Hamlet’s indecision has to be rendered by an actor with incredibly strong instincts for nuance and timing or it comes across as mere confusion. The obvious and avoidable screw ups — when Hamlet forgot his lines in hist first scene, or when Polonious (played by Sam Waterson) got so off track in Act II, scene i you could hear crickets chirping — that I can blame on the weather. But some problems were in the production concept, and those problems aren’t going away even after the rain clears up. Hamlet is definitely not a he-man or a “decider“. When Claudius tells him in the second scene that his grief for his father is “unmanly” he tells us, the audience, that Hamlet is going to have a crisis of heroism. I was no fan of Mel Gibson’s Hamlet for this very reason: Hamlet is a sensitive boy. 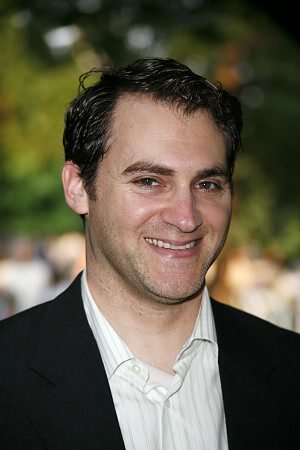 But casting Michael Stuhlbarg as the dithering Dane made Hamlet into Alvy Singer, a neurotic bumbler who tosses out one-liners like a borscht belt comedian. Sam Waterson played Polonius, and as I said above, the rain may have had something to do with his inability to deliver his lines. It could also have been because Richard Easton was originally cast for the part (though in the program Waterson credited as Polonius). Did they have a last minute personnel switch-up? Is this a sign that Eustis’s ship has leaks? Pray you, Mr. Eustis, tell your actors this. They start the play by shouting, and have no other means to increase the dramatic tension than by increasing the volume of their voices.